This disease (MS) is an autoimmune disease of the central nervous system (CNS) where the body's own immune cells attack the nervous system. With this disease, inflammation of nervous tissue causes the loss of myelin, a fatty material that acts as a sort of protective insulation for the nerve fibers in the brain and spinal cord. This demyelination leaves multiple areas of scar tissue (sclerosis) along the covering of the nerve cells, which disrupts the ability of the nerves to conduct electrical impulses to and from the brain, producing the various symptoms of multiple Sclerosis. Multiple Sclerosis (MS) is a chronic neurological disease that affects the nerve cells in the brain and spinal cord. Under normal circumstances, nerve impulses throughout the body pass along nerve fibers, which connect to one another at synapses. A fatty substance called myelin insulates the nerve fibers and facilitates the smooth transmission of high-speed messages between the brain, the spinal cord and the rest of the body. Multiple sclerosis is a disease in which the myelin (a fatty substance which covers the axons of nerve cells, important for proper nerve conduction) degenerates. This includes not only the usually known white matter demyelination, but also demyelination in the cortex and deep gray matter (GM) nuclei, as well as diffuse injury of the normal-appearing white matter. Damage to any part of the myelin sheath disrupts the messages that are being transmitted within the body. In MS, misguided cells of the central nervous system destroy areas of myelin. As a result, myelin becomes inflamed and swollen, leaving scar tissue called sclerosis. Sometimes the nerve fiber itself is damaged. With damaged myelin and nerve tissue, the nerve fibers cannot conduct electrical impulses to and from the brain as well. This produces the various symptoms of multiple sclerosis. Typical disturbances include blurred or double vision, red-green color distortion, or perhaps temporary blindness in one eye. Weakness in the extremities may result in a general feeling of fatigue, along with difficulty walking and balance disturbances. These are referred to as paresthesias, which are feelings of numbness, tingling or increased pain perception. This symptom may be manifested by memory problems, difficulty concentrating, impaired visual and spatial perception or difficulty expressing oneself in oral and written form. A person could also have hearing impairments, speech difficulties, dizziness and tremors. Progression of MS may lead to problems with bowel and bladder control and sexual dysfunction. People who are affected by this disease have patches of damage called plaques or lesions that seem to appear randomly on the CNS white matter. Multiple Sclerosis never affects any two people the same way and each intervals disease is unique only to him or her, just like fingerprints. The body's immune system attacks the outer nerve sheath or myelin , which causes scarring or sclerosis , and this scarring interferes with the transmission of the signals required for normal operation. The most common symptoms of Multiple Sclerosis are sensory in nature including tingling, peculiar nerve sensations such as a “pins-and-needles” feeling over part of the body, numbness or paresthesias, clumsiness, weakness of a let or hand, visual disturbances. Recent research indicates that the biochemical make-up of lesions may vary between different forms of the disease, causing nerve damage to one site usually causes completely different symptoms than damage to another, and this is one of the reasons Multiple Sclerosis differs so widely between people. People with Multiple Sclerosis can experience partial or complete loss of any function that is controlled by, or passes through, the brain or spinal cord. Inflammation happens in areas of the white matter of the central nervous system in patches and destruction of myelin is soon to follow. Myelin is the fatty covering that insulates nerve cell fibers in the brain and spinal cord. Other weaknesses occur in one or more of the extremities, slight stiffness or unusual fatigue of the limb, spastic involuntary movements, difficulty with bladder control, incontinence, vertigo, and in some cases mild emotional disturbances. Excessive heat may intensify symptoms. Because the symptoms of Multiple Sclerosis vary and can be very unpredictable. It may affect the eyes first and usually only one eye at a time. One may notice blurred or double vision, blind spot, distortions of reds and greens, or blindness in both eyes. Certain muscles may become weak or extremely stiff and prone to spasms; you may start to have trouble talking because there are disturbance between the central nervous system and the rest of your body. Half of all patients with later stages of Multiple Sclerosis have problems with memory loss. Once a doctor suspects the disease he or she will order an MRI scan to look for signs on the brain and spinal cord. If you have any of the symptoms described here, go to your doctor and get checked out. The sooner you learn you have a disease, the sooner you can start fighting it. How Is Multiple Sclerosis Classified? Multiple sclerosis is actually characterized by the disruption of the normal functioning of the peripheral nerve connections of the spinal cord and brain. It is a complex disease which is idiopathic, meaning that its cause remains unknown. This further means that multiple sclerosis is not easily prevented nor cured. What is considered as compensation is the finding that multiple sclerosis is generally not a life-threatening disorder. There are existing treatment methods that are able to successfully control the disease’s underlying symptoms. It is through these treatment modalities that the development of multiple sclerosis can be slowed and those with complaint are given chances to live active and normal lives. Multiple sclerosis is believed to occur mainly because of the destruction of the myelin. Myelin a substance made up of adipose that insulates the nerve cells. Apart from providing protection for the tissues and the nerve cells, the myelin also serves as a facilitator in transmitting nerve impulses all throughout the body. When there is demyelization, the nerve tissues harden and the whole nervous system becomes damaged. It is the impairment of the nervous system that leads to the wide variety of multiple sclerosis symptoms. Multiple sclerosis can actually be classified according to two characteristic groups which are relapsing - remitting type plus chronic - progressive type. The latter classification is further divided into three, primary - progressive, secondary - progressive and progressive - relapsing. These classifications are made according to the frequency and the intensity of the generated symptoms, including the disease’s rate of progression. This is the most ordinary form of multiple sclerosis. It majorly affects persons who are young or middle-aged. This type’s major characteristics are soft and tend to occur only in flares. It is after the short duration of the symptomatic flare-ups that remission occurs, thus producing unperceivable symptoms for a couple of weeks up to months. The remission phase usually occurs naturally but the use of immunosuppressive medications can hasten the duration and the occurrence of its periods. Usually, after the remission phase has completely passed, a short relapse time follows. The relapse is commonly characterized by the strengthening of the disease’s general symptoms. Multiple sclerosis cases are slow in progressing and do not involve spontaneous remission phases. This type predominantly affects those who are forty-five years old and above. Twenty percent of those with multiple sclerosis have the chronic - progressive type. The primary - progressive multiple sclerosis comprises of a predictable pattern of development. The aforementioned subtype gradually evolves without having any periods of remission. This subtype is commonly comprised of approximately ten percent of those who are definitively given the diagnosis of multiple sclerosis. The secondary - progressive subtype affects half of those who are diagnosed with multiple sclerosis, specifically the relapsing - remitting type. This subtype is usually involved with flare-ups that are also associated with some periods of remission. This last subtype of the chronic - progressive type of multiple sclerosis is actually a very rare form. Although this subtype is gradual in its progression, it is compensated with having only short periods of symptomatic flare-ups. Although the cause of MS remains unknown, researchers are continually learning more about this disease. Many believe that MS is an autoimmune disease that results when the body begins to attack its own tissues. Normally, the immune system works by recognizing foreign invaders and producing its own cells to counteract or defend against attacks. In MS, the immune system incorrectly identifies body cells as invaders and begins to attack its own cells. In the case of MS, the body no longer recognizes myelin as its own, and, thus, declares war on this sensitive nerve tissue. Genetics may play a role in determining who gets MS. Overall, the chance of developing MS is less than one-tenth of 1 percent. However, if one family member has MS, that person's first-degree relatives (parents, children and siblings) have a 1 percent to 3 percent risk of getting MS. Some researchers believe that genes can make you more susceptible to getting MS. Then something in the environment, possibly a virus, triggers the abnormal immune response that causes MS. Multiple Sclerosis (MS) is a chronic neurological disease that affects the nerve cells in the brain and spinal cord. Under normal circumstances, nerve impulses throughout the body pass along nerve fibers, which connect to one another at synapses. A fatty substance called myelin insulates the nerve fibers and facilitates the smooth transmission of high-speed messages between the brain, spinal cord and the rest of the body. Damage to any part of the myelin sheath disrupts the messages that are being transmitted within the body. In MS, misguided cells of the central nervous system destroy areas of myelin, leading to the formation of plaques and the eventual buildup of scar tissue (sclerosis) at the site. The scar tissue tends to form at various locations; hence the disease has been termed multiple sclerosis. Some of the diseased areas of the myelin may cause no apparent symptoms, while other areas interfere with a particular function or sensation that is controlled by the brain or spinal cord. For this reason, the type of symptoms and the severity of the disability varies greatly among those affected with MS. The symptoms associated with multiple sclerosis (MS) present in a variety of ways. They can be mild or severe, short-lived or longer-lasting, and they often appear in different combinations. MS is a chronic disease that is often characterized by intermittent periods of relapse, followed by partial or complete remission. Some people with MS show little or no progression of symptoms after the initial attack while others suffer a rapid progression of the disease that can result in severe disability. According to the view of most researchers, a special subset of lymphocytes, called T cells, plays a key role in the development of MS. Under normal circumstances, these lymphocytes can distinguish between self and non-self. However, in a person with MS, these cells recognize healthy parts of the central nervous system as foreign and attack them as if they were an invading virus, triggering inflammatory processes and stimulating other immune cells and soluble factors like cytokines and antibodies. Normally, there is a tight barrier between the blood and brain, called the blood-brain barrier, built up of endothelial cells lining the blood vessel walls. It should prevent the passage of antibodies through it, but in MS patients it does not work. A deficiency of uric acid has been implicated in this process. Uric acid added in physiological concentrations (i.e. achieving normal concentrations) is therapeutic in MS by preventing the breakdown of the blood brain barrier though inactivation of peroxynitrite. According to a strictly immunological explanation of MS, the inflammatory processes triggered by the T cells create leaks in the blood-brain barrier. These leaks, in turn, cause a number of other damaging effects such as swelling, activation of macrophages, and more activation of cytokines and other destructive proteins such as matrix metalloproteinases. The final result is destruction of myelin, called demyelination. Repair processes, called remyelination, also play an important role in MS. Remyelination is one of the reasons why, especially in early phases of the disease, symptoms tend to decrease or disappear temporarily. Nevertheless, nerve damage and irreversible loss of neurons occur early in MS. Proton magnetic resonance spectroscopy has shown that there is widespread neuronal loss even at the onset of MS, largely unrelated to inflammation. Often, the brain is able to compensate for some of this damage, due to an ability called neuroplasticity. 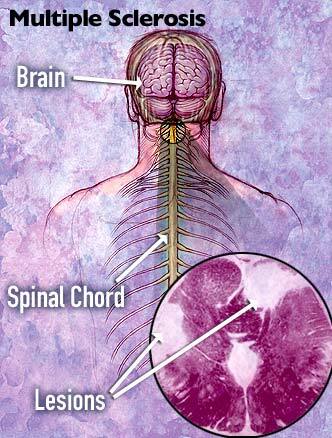 MS symptoms develop as the cumulative result of multiple lesions in the brain and spinal cord. This is why symptoms can vary greatly between different individuals, depending on where their lesions occur. The oligodendrocytes that originally formed a myelin sheath cannot completely rebuild a destroyed myelin sheath. However, the central nervous system can recruit oligodendrocyte stem cells capable of proliferation and migration and differentiation into mature myelinating oligodendrocytes. The newly-formed myelin sheaths are thinner and often not as effective as the original ones. Most people with multiple sclerosis are diagnosed between the ages of 16 and 40, but some people are affected earlier and others do not get their first symptoms until age 60. It is estimated that in the United States, 250,000 to 350,000 people have MS, and each year about 10,400 people are newly diagnosed. Multiple sclerosis affects women almost twice as frequently as men. Caucasians are more than twice as likely as African-Americans or Hispanics to get the disease. The disease is relatively rare among those of Asian descent. The disease is more common in temperate climates -- like those in the northern United States, Canada and Europe -- than in tropical regions. The fact that MS is more prevalent in certain climates leads researchers to speculate that environmental factors play a role in the development of MS. Research in this area has yet to provide conclusive evidence of a direct link between the environment and MS. Multiple Sclerosis is more likely to occur in northern Europe, the northern United States, southern Australia, and New Zealand than in other areas. The common bacteria, being talked about, are the porphyromas gingivalis, which is very common in human beings. These bacteria produce a very unique form of lipid called phosphorylated dihydroceramides or DHC’s. The DHC enhances the inflammatory response of the person. Also, this lipid is produced in other regions of the body, usually in the gastrointestinal tract. These bacteria can be detected by identifying first if there is any DNA that specifically responds to this particular strain. This can be done by having a polymerase chain reaction, which is used for characterizing any evidence of DNA that specifically respond to the porphyromas gingivalis. With this diagnostic tool, the presence of such bacteria can be identified in the oral cavity. This further suggests that early detection, including eradication, pay important roles in prophylaxis for this autoimmune disease. Actually, a study was initiated by experts from the University of Connecticut Health Center such as Robert Clark and Frank Nichols. They started with this research in order to determine if such lipids can accentuate the immune-mediated impairment in this specific autoimmune sickness. According to the findings of this study, the disease’s severity was enhanced whenever there were more these lipids. This concludes that the DHC’s which were phosphorylated from the said bacteria that are usually found in the body of humans can actually trigger, or in some cases, increase, the severity of multiple sclerosis. It is already a known fact that during an autoimmune attack, the own immune system attacks self tissues that could either be healthy or damaged. Either way, the immune system’s cells attack them all. In the case of multiple sclerosis, the cells attack the protective covering of the nerves which is called the myelin. Apart from serving as protection, the myelin also aids in the proper transmission of signals between the brain and the rest of the body. After proving that phosphorylated DHC’s from common bacteria found in humans can aggravate the process of this particular autoimmune system. They have also determined that phosphorylated DHC’s have a big potential to be the markers of multiple sclerosis’ disease process and also as the new targets when it comes to therapeutic intervention. One of the worst symptoms associated with multiple sclerosis is the cognitive dysfunction. This means that communication is not an area a person with MS could excel in. They cannot easily keep up with a certain conversation regardless of who the conversation is with, but especially if there are more than two people who are conversing. With this said, it would be near to impossible to see people with MS randomly chatting with unfamiliar people because of the jovial atmosphere. Of course, they cannot be locked inside their own homes. Despite the fact that they have MS, they also still have a life to live. They also do not have to act like astronauts in wearing all that protective gear. What they have to avoid are febrile illnesses such as the flu. With today’s pandemic, the H1N1, people with MS have to be extra careful. To avoid getting such life-threatening diseases, immune-compromised people with multiple sclerosis should make sure that they get the necessary vaccines ahead of time. Also, places that have sick people must be avoided. This does not only mean hospitals or clinics. This also means houses of family or friends who house a sick person like someone who caught the flu. There is a collection of tests that are needed to finally diagnose multiple sclerosis. This is so because there is no single diagnostic exam that is entirely proof-positive for the disease’s diagnosis. Since the whole diagnosing process is difficult, a neurologist should be consulted as an evaluator. There is a ten percent among those who are said to have multiple sclerosis that actually has a disease that merely mimics multiple sclerosis. Such diseases that are usually mistaken as multiple sclerosis are multiple strokes, brain infection, inflammation of the blood vessels, lupus and vitamin deficiency. There are also some stress-related diseases that are misdiagnosed as multiple sclerosis. An accurate diagnosis of multiple sclerosis needs a complete medical history plus a neurological examination, which examines both the brain and the spinal cord. A lot of the diagnosing part, if not all, greatly depends on the correct questions asked by the physician in order to correctly uncover or discover important information. In addition to a thoroughly taken medical history and physical assessment, there is also a variety of highly specialized procedures that are extremely helpful. Such procedures are spinal taps, MRI which makes use of imaging techniques, lumbar punctures which examine the cerebrospinal fluid running through the spinal column, laboratory analysis of the person’s blood, and evoked potentials which are basically electrical tests that determine if the pathogenesis of multiple sclerosis has affected the nerve pathways. First of all, it is in accordance to ongoing research that, multiple sclerosis occurs to those who are between twenty and fifty years of age. Aside from the weakening of the immune system, this age range is usually the one affected with the disease’s predisposing and precipitating etiologic factors. For multiple sclerosis to be diagnosed there must be the presence of symptoms or signs that indicate damage or disease of the brain or the spinal cord. Also, since an MRI is compulsory, multiple sclerosis can only be diagnosed when there is evidence of two or more lesions. And of course, when all else fails and there is no other explanation for the underlying symptoms, the doctor could resort to diagnosing it as multiple sclerosis as long as the symptoms are congruent with that of the aforementioned disease. What can be seen in the MRI scan? With MRI, the neurologist is able to visualize any scar tissue in the deeper parts of the brain or the spinal cord due to the occurrence of multiple sclerosis. However, the very same lesions can also be seen in other conditions such as migraine headaches and hypertension. With this in mind, diagnosing multiple sclerosis is the last thing the physician would declare, since a group of tests are still needed to be done. There is a five percent among those who have multiple sclerosis that does not show lesions on their MRI scan, probably because the lesions are somehow unique and cannot be easily detected by an MRI. Therefore, an MRI test is not completely depended on for immediately diagnosing or ruling out multiple sclerosis. Our bodies fight infection by producing white blood cells, a natural disease fighter. However, in people with multiple sclerosis, the protective covering of the nerve fibres (myelin) is also attacked by these white blood cells. One of the tests done to diagnose multiple sclerosis is a lumbar puncture. In this test, cerebrospinal fluid is extracted from the spine through a hollow needle and is examined for signs of this disease. The hidden signs of multiple sclerosis can also be detected using an MRI (magnetic resonance image). This uses a combination of radio waves and magnetic fields that provide a detailed view of the brain and spinal cord. By using this, the lesions in the myelin can be detected. Because no known way to prevent or cure multiple sclerosis (MS) exists, the main focus of daily care is aimed at symptom management and efforts to stabilize progression of the disease. This is the treatment of choice for relapsing-remitting MS. The medication is available in two forms. Interferon beta-1a (Avonex® Rebif®) and interferon beta-1b (Betaseron®) are medications made by a biotechnological process from one of the naturally occurring interferons (a type of protein). They are administered by injection and reduce the risk of disability progression, result in fewer relapses, and reduce the number and size of active lesions in the brain. Glatiramer (Copaxone®) is a medication that is an alternative to beta interferons. Like interferon, this medication can reduce the number and severity of attacks as well as the overall progression of the disease to some extent. Glatiramer requires daily injections. Natalizumab (Tysabri®) is used for relapsing-remitting MS. Tysabri was approved by the U.S. Food and Drug Administration (FDA) when not to be used in combination with another disease-modifying therapy. It is given to slow down the progress of MS and cut down on flare ups. Because this medicine can have serious side effects, it is usually given to people who have not responded to other therapies. It is given once a month with an intravenous drip into a vein. Mitoxantrone (Novantrone®) is a chemotherapy drug used for many cancers. It is also FDA-approved for certain forms of MS. It can cause serious side effects, including heart damage with long term use. Your doctor will closely watch you when you take it. Mitoxantrone may reduce how many relapses you have and keep your disability from getting worse. This drug is an alternative treatment for relapsing-remitting MS when both interferon and glatiramer fail. This drug treats certain forms of progressive MS. This class of drugs is often used to treat MS relapses. The medication is usually given intravenously and has proved helpful in decreasing the length of relapse and promoting remission of symptoms. However, there is no proof that steroid medications have a positive effect on the long term outcome of MS. Many people with MS are affected by this condition that mostly affects their lower extremities, causing stiffness and increased muscle tone. Spasticity can be treated with muscle relaxants and tranquilizers. Physical therapy also can help. Urinary problems of MS can include bladder infections and urinary retention. Although medications are available to treat both of these problems, some patients may require urinary catheters to empty the bladder. This is a common complaint that can result from weakened musculature. It often can be successfully treated with a high fiber diet, adequate fluid intake and bulking agents such as Metamucil®. Some men with MS report erectile difficulties, while the most common sexual problems in women with MS appear to be changes in sensation and vaginal lubrication. Medications are available to help with these symptoms. Sildenafil (Viagra®) is used to treat men with erectile dysfunction. Fatigue is the most common complaint occurring in 80 percent of patients with MS. Amantadine (Symmetrel®) is effective half the time in relieving disabling fatigue. Research shows patients diagnosed with MS are at greater risk for depression than the general population. Some researchers believe that MS demyelination in certain parts of the brain may play a role in depression. Many drugs can treat depression. Even treating multiple sclerosis has a conventional type. Usually, a Beta Interferon is injected into the body as it decreases the flare-ups of multiple sclerosis. With the use of a protein that has already undergone some genetic engineering; the medication is able to reduce the disease’s general activity. However, the Beta Interferon does not have any power when it comes to reversing what has already been damaged. Despite the fact that the protein being used in this treatment method is very similar to a protein that is already inside the human body, many still find it difficult to successfully tolerate the medication. This is mainly because the drug’s side effects can oftentimes be unmanageable. With this in mind, physicians usually prescribe or suggest this kind of treatment for those who have the relapsing type of multiple sclerosis. Since the Beta Interferon is only for those with complaint but can still walk, physicians prescribe other drugs that can also treat the symptoms of the subject in topic. However, these drugs can only serve to prolong life by making it more comfortable for the person living it. Most of these alternative drugs do not have the power to reduce the process of the pathogenicity of the disease nor can it reverse the disease. For flare-ups, doctors usually prescribe an analgesic, which is the medical term given to pain relievers, muscle relaxants and corticosteroids. Masking symptoms is a no-go. Covering up symptoms associated with multiple sclerosis is never a great idea. The only best way to treat, according to statistical research, is that people should improve their life by modifying their lifestyle. For instance, those who have multiple sclerosis should know which food are safe to eat and which ones should be avoided. Physicians and nutritionists state that a diet rich in vegetables and fresh fruits is best for multiple sclerosis. Also, a reduced amount of saturated fats has been proven to be very helpful and beneficial. As much as possible, those who have multiple sclerosis must avoid stress at all costs. To attain this, they have to do some relaxation techniques or exercising that renders them and their system stress-free. Examples of such exercises are walking, yoga, swimming and tai chi. Also, it is important that people with multiple sclerosis keep a positive attitude above all. Although attitude cannot do anything for definitely curing the disease, it can help in reducing the stress. And once stress is reduced, if not totally avoided, then the symptoms are greatly reduced as well. At this time, multiple sclerosis is incurable, although there is research taking place globally in an effort to find a treatment that will slow down the progression of this illness. In the meantime, there are a number of options which may make life more bearable. Some doctors prescribe ACTH, a steroid that accelerates the healing actions of the body. Though there is no scientific evidence that special diets are beneficial, anecdotal evidence suggests that diets such as gluten free diets or those low in animal fats do help. Many multiple sclerosis sufferers seek out alternative therapies to relieve their symptoms. This may include acupuncture, homeopathy, and yoga. For each person, the answer may be different and, though multiple sclerosis has no cure, it is important for the sufferer to find a positive way of living with this illness. Scientists are continually looking for therapies that affect the overall course of MS by improving recovery from attacks, preventing or decreasing the number of relapses and halting progression of the disease. This form of MS is characterized by relapses (episodes where the symptoms get worse), lasting from a few days to several weeks, followed by remissions (periods when the symptoms resolve). Between relapses the patient's condition is usually stable. About 80 percent of patients begin as relapsing-remitting. In this form of MS there is a gradual but continuous worsening of symptoms from the time the disorder is first recognized. Periods of relapse and remission are absent. In this form of MS a person who initially had relapsing-remitting MS begins to develop a gradual deterioration in nerve function, with or without relapses. Secondary progressive MS ultimately affects 50 percent of those with relapsing-remitting MS.
Progressive relapsing MS shows clear progression in the level of disability from the time symptoms first begin, but with episodes of clear relapses that may or may not be associated with some recovery following the acute episode. Some people actually prefer not to take any MS therapy, since several of the medications for multiple sclerosis have some serious side effects which pose high risks. With Multiple Sclerosis, there will be days when you are feeling quite well and there are days when you are not feeling okay. There will be bouts of symptoms which may occur at anytime of the day, several days at a time during when these symptoms may not feel the same as they were yesterday. Practice deep breathing – Sometimes the only relief you will get is the ability to control your breathing. So try doing deep breathing. Fill in your lungs with as much air as you could and slowly exhale. Improve your strength – If your body allows it, do some strength training. Though the fatigue you are experiencing roots from neural dysfunction, it would still help to augment your sometimes incapacitated body with building some lean muscles. Get some counseling – Whether it's over the phone or face-to-face, counseling still works well in providing emotional and psychological assistance to the patient. Sometimes, these are the only things that can relieve the sufferer from the physiological and psychological tolls of multiple sclerosis. Do some creative visualization – A number of MS patients do this and many of them agree that it can help. Creative visualization is the process of creating mental images that may elicit various sensations. A good exercise is to imagine that you are bound by something, say rubber bands. One by one, try to mentally visualize that you are removing these bands from yourself. Be sure to incorporate and be sensitive to the sensations associated with this exercise. Address your physical problems with physical therapy – Try improving your balance, the pain you experience, your body's lack of coordination, the weakness of your limbs, and your muscular spasms through the help of a physical therapist. Don’t rely on a wheelchair – As much as possible, refrain from using aids such as crutches and wheelchairs. For most patients, these are unnecessary; it should be the same for you. Instead, allow your legs, hips and lower back to develop strength. Inquire about steroids – If your symptoms include blurriness or pain in the eyes, ask your doctor about steroids. These should help relieve the discomforts. 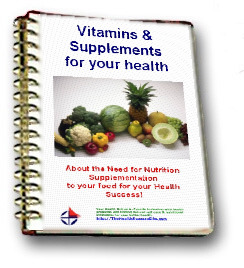 Try the alternatives – Consider alternative medicines and treatments. These may not be backed by scientific studies, nonetheless, there are anecdotal evidences that they work in the management of this condition and its symptoms. Seek the help of your counselor concerning your home/place of work – There should be no second guessing on this. Your home or workplace must be safe for you at all times. Seek a counselor to give you guidance. Seek help - There are pharmaceutical companies, support groups and organizations that can help you with respect to your treatments. There are also organizations that provide financial help. Do not hesitate to approach them. Frustrated and stressed out? – There are stress management techniques and stress therapies available at your disposal. Sometimes, they do not cost a penny. Try to incorporate them in your treatment options. Exercise – Keeping an active body may divert your attention from the pain. There is so much you can do with your condition so there is no reason for you to give in to suffering. Seek your options, now. These therapies are normally inclusive of popular alternative therapies that are also commonly used for other diseases and disorders. Because many of such conditions are not yet fully understood and therefore lack appropriate treatments and cures, the scientific community presents other options within the non-conventional paradigm. Among these therapies are herbal remedies, acupuncture, yoga, aromatherapy, emotional healing, reflexology, meditation, chiropractic treatments, Pilates, hypnotherapy, homeopathy, use of antioxidants, and others. Many patients of multiple sclerosis find relief through these therapies which make them very likely choices as treatments. While they may not totally remove the symptoms or prevent them from relapsing, these treatment options, however, can relieve the patient from the pains and discomforts brought about by the symptoms. Parts of a patient's treatment are the face-to-face counseling and counseling over the phone or telephone counseling. These are commonly known as talk therapies. The main goal here is to provide emotional and psychological support for the sufferer. What's good about these treatments is that the counselor fully understands the condition and may add considerably in the patient's capacity to handle his disease. Fatigue is commonly experienced by patients of multiple sclerosis, no matter what the type or how severe is the form. Thus, patients are encouraged to conquer this by doing some remedies such as proper dieting, conservation of energy, participating in regular workouts, and stress management. Further reading through our articles on Multiple sclerosis health issues will give you a body of information that will help you decide what options you have to deal with the underlying causes of your problem through giving your body the nutrition products that will assist you body to heal from the inside out. We wish you well in your search for solutions to this Multiple sclerosis problem and your movement towards better health in all areas. SITE DISCLAIMER: Do these products “cure” anything? Of course not… but it stands to reason that if you cleanse your body and feed it the finest nutrition available, giving it everything it needs in balance, on a daily basis, that your body will do what nature intended, and give you the best possible chance to fend off sickness and disease. This Multiple sclerosis your health online information is not presented by a medical practitioner and is for educational and informational purposes only. The content is not intended to be a substitute for professional medical advice, diagnosis, or treatment. Always seek the advice of your physician or other qualified health provider with any Multiple sclerosis questions you may have regarding a medical condition. Never disregard professional medical advice or delay in seeking it because of something you have read. Any natural and/or dietary supplements that are not FDA approved or evaluated must be accompanied by a two-part disclaimer on the product label: that the statement has not been evaluated by FDA and that the product is not intended to "diagnose, treat, cure or prevent any disease”. The Multiple sclerosis resources on this your health online site are not intended to be a substitute for professional advice. While all attempts have been made to verify information provided in this publication, neither the author nor the publisher assumes any responsibility for errors, omissions or contrary interpretation of the web site Multiple sclerosis subject matter herein. The what is Multiple sclerosis your health online site Multiple sclerosis contents are solely the opinion of the authors and should not be considered as a form of advice, direction and/or recommendation of any kind. If expert advice or counseling is needed, services of a competent professional should be sought. The what is Multiple sclerosis author and the Publisher assume no responsibility or liability and specifically disclaim any warranty, express or implied for any products or services mentioned, or any techniques or Multiple sclerosis practices described.